There are many reasons why Mars excels at destroying expensive equipment. For one thing, its entire surface is made of partially-magnetized dust. For another, Mars possesses just enough atmosphere so that the dust floats and coats photographic lenses. At the same time, it doesn't have enough of an atmosphere to protect electronics from ultraviolet radiation. The trace gases and humidity in the air it does have contaminate all but the most tightly sealed instruments. Mars' frigid temperatures, low pressures and rapidly changing winds push landers to their operational limits. To build equipment that functions well under these conditions, we need testing environments on Earth that duplicate Mars' many imperfections as perfectly as possible. In their article, "Mimicking Mars: A vacuum simulation chamber for testing environmental instrumentation for Mars," Jesus Sobrado and his colleagues at the Center for Astrobiology in Madrid explained how they created the world's best testbed for Martian expedition equipment. While other chambers may integrate two or three of the factors that make life difficult on Mars, the Center for Astrobiology's simulator offers almost all of the red planet's challenging variables. These includes not only low pressures and temperatures, but also dust, wind, relative humidity, atmospheric gases and even radiation. 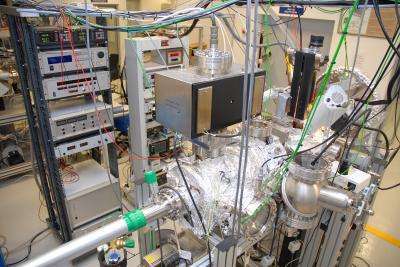 The modular simulation chamber-nicknamed MARTE-works by combining superior versatility with new technology. MARTE's flexible physical design allows it to be re-configured to accommodate equipment of a varying of sizes and shapes. In anticipation of the conditions a device will face on Earth, Mars, and everywhere in between, MARTE's environment is totally tunable. For example, the average pressure on Mars is roughly 7.5 millibars at the surface. Earth's air pressure is 1000 mbar at sea level and 300 mbar on Mt. Everest. In space, of course, there is no air pressure. To reflect those varying conditions, the options for air pressure inside MARTE range between 1000 to 10−6 mbars. The inner atmosphere starts as an analog of Martian air-95% carbon dioxide, with some Argon, hydrogen and nitrogen-but can be adjusted. MARTE's internal temperature can be turned down to as low as -265.27 degrees Fahrenheit (-165.15 degrees Celsius) or as high as 301.73 degrees Fahrenheit (149.85 degrees Celsius). 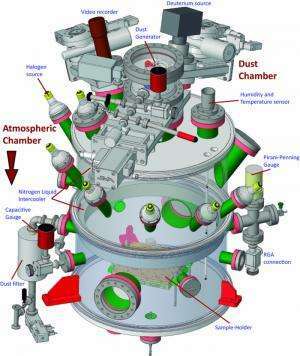 "We're simulating the effect of the Martian dust—one of the primary problems for planetary exploration—to gain a better understanding of how instruments behave when covered in dust," said Jesus Sobrado, the scientist in charge of the simulator's development. He went on to say, "[the chamber] answers many questions about Mars or other related planetary bodies—both from scientific and technology points of view."